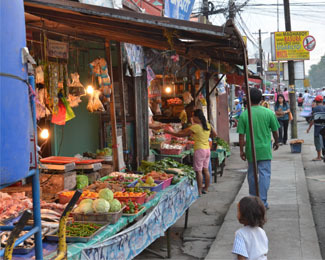 ILOILO CITY, the Philippines - We arrived safely in the Philippines on Monday after many hours of travel. We were greeted at the airport in Manila by several friends of the Dagohoys who treated us to a delicious Filipino lunch and then transported us to our final airport for the flight to Iloilo City. One of their friends, Mae, is a local doctor and director of the Ruth Foundation for Palliative Medicine and Hospice Care in Manilla. Less than two weeks after the typhoon struck, she traveled to Concepcion with her foundation to provide medical relief to people on one of the islands. Their relief work was described as the biggest operation by a private organization in the island of Panay. She was able to share with our team about the needs she saw while she was there. Once we arrived in Iloilo, there was a welcome party at the airport. Cecile's mother, Digna, Ernest's brother, Prudence, and a couple of local pastors and friends greeted us, loaded our bags and took us into the city. The Filipino people are so warm and friendly. They have already extended so much kindness to us and have repeatedly shared how much of a blessing it is to know that Christian brothers and sisters around the world care enough about them to come and find ways to help. On Monday evening, we met at the headquarters of the Convention of Philippine Baptist Churches in Iloilo. Bags of rice and sugar lined the entryway into the building, a visual expression of the goods that have been collected to distribute among the islands. 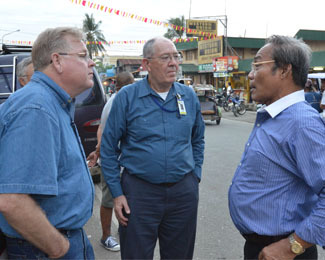 General Secretary Judson Herbilla and several local pastors shared with us about the devastation in their area. They have already canvassed their province and have been working alongside pastors and churches to provide as much relief as they can. It is clear that the Filipino people from across the country have been working to provide as much help as they can in this disaster area. While immediate needs for food and medicine have been distributed, there is still a great need for recovery efforts to help rebuild the cities and towns that were essentially wiped away by the waters. In the Iloilo province alone, the convention has identified 20 churches that were completely destroyed, and 1,440 homes that were partially or totally damaged affecting around 2,500 families. Tuesday morning we are heading to Concepcion for our first disaster assessment. Please be in prayer for our team as we go around the city, meet with pastors and individuals, and assess how to help rebuild. We will be bringing water filters and medicine to distribute and roofing supplies and food will be delivered upon our arrival to share as well. There is much work to be done over the next few days. Please pray for God to guide our steps and direct our path as we seek to share hope with those we encounter. As plans develop, funds will be needed to begin reconstruction efforts. To donate to Texas Baptist Disaster Recovery, click here. To donate to TBM disaster efforts, click here.